As the online platform surges forward, more of us are using videos to research products, services and information.... it's refreshing to hear of an initiative that leans on low-tech simplicity to bring a whole new marketing tool for those searching for a fresh online 'edge'. Enter Pixel Maché, brainchild of multi-award winning portable filmmaker Jason van Genderen (Treehouse Creative) and gadget guru Dave Abarahams (Organise Internet). At face value, Pixel Maché provides businesses with a low-cost, customised online TV channel that's easy to use, encourages user-generated content and provides brands with a completely new way to present their message to a new video-centric audience. "It's brutally simple yet an incredibly powerful offering all rolled into one", says Dave "considering the recent explosion of online video media, many businesses are realising the need to have a presence there but either have no time, no resources, or no understanding of how to monetize it. 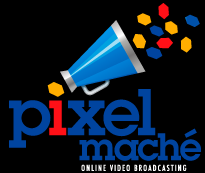 Pixel Maché is a turn-key broadcasting solution for businesses on the front foot." The distinctly unique offering goes beyond the platform itself. For less than $5,000, businesses can have their own online broadcasting platform created, including registration of their TV domain name, design of a custom channel space, portable HD video camera kit, full training, custom YouTube host channel, content management system, and targeted SEO marketing. More importantly, this allows businesses access to a globally recognised multi-award winning expert in mobile film-making (Jason). Imagine having a Tropfest winning director guiding your team and sharing his secrets and tips on creating concise, simple webisodes that sell your products or service. "I've seen inferior systems sell for more than $22,000, without the in-depth training we offer. Pixel Maché represents a whole new democracy in this space; at a price that's within reach for even the smallest of businesses." added Jason "We can show any business how they can embrace the online medium to help spread their commercial message into a whole new space". Dave adds "and remember that YouTube is a search engine affirming technology, something that boosts your online presence massively." Several Pixel Maché early adopters include Apex Insurance Brokers, along with Cherry Road Nursery. Darren Hutton, managing director of Apex Insurance is excited about using this new channel to both educate and market their services to a broader audience. For more information, email info@pixelmache.tv or go to www.pixelmache.tv to see what it's all about. Is "Free" software a curse? Having just gone through a bruising series of quotes with a large customer and losing the bid I'm feeling a little dark. Not at the company that picked up the contract, good luck to them and good luck our (until recently) 'customer'. But I've heard on the grape vine that they've gone down the "free software" route. Something that as an online professional I find both amazing but also quite worrying. Has the whole online world gone DIY? Well perhaps. You can get most things for free: Free email accounts, free websites, free social media apps, free document storage systems, free calendars, free advertising and even free sexual prowess, apparently. Wasn't it The Beatles that sang "Money can't buy you love" so presumably that's free too. So I find myself wondering if I should pack it all in and head for the hills and grow bananas. I can at least sell them at our local markets for a pretty penny at the moment. Then I remembered something that happened to a friend of mine recently. His identity was stolen. First his eBay user name then progressing to his PayPal account, which lead to further to freeze his real bank account, his telephone account and regular bill draws, not to mention his email and Facebook account. Ouch. Ouch Ouch. I remember at the time deeply sympathising with him as he rang endless corporations that sadly by default did not believe he was himself. It just goes to prove the adage "If you don't pay for the product, you are the product". I reckon "free" is good if it's about beer or chocolate but I think that "free" is bad when it comes to building trustworthy communications systems and relationships. "Free" software systems are in other words also free from responsibility, security and reliability. After that little thought bubble I'm feeling better. Free beer to all of my friends.